The German chancellor faces a rising revolt within her own party. In September, German Chancellor Angela Merkel faced an open revolt in her own party. Merkel’s leadership has long been in jeopardy, but few have dared to oppose her outright—until now. The first major sign of revolt came unexpectedly on September 25. An election for the head of the parliamentary group of the Christian Democrats was seen as a mere formality. Merkel strongly endorsed incumbent Volker Kauder, who has been one of her trusted confidants for 13 years and a pillar of political stability within her party. Voting against Kauder would mean opposing Merkel. Even as an opposing candidate, Ralph Brinkhaus, emerged, most of the media paid little attention to him. But on election day, a political earthquake hit. Kauder lost against the newcomer. Many see the parliamentarians’ choice as an outgrowth of a smoldering rebellion that is beginning to break out. The 125 votes for Brinkhaus are seen less as a demand for new leadership in the parliamentary group than as a voice of dissent against Merkel. Vice president of the Bundestag Thomas Oppermann called the outcome “an uprising against Merkel” (Trumpet translation throughout). Two members want to compete against their party leader at the party congress in December. Since she could no longer hold Volker Kauder as a group leader, her power position is publicly questioned for the first time. She is now seen as vulnerable. Merkel’s party leadership has been undisputed for 18 years, but the revolt is now rising. Opposing candidates seem puny compared to her, but parliamentarians may again show their hostility by voting against her, united in their goal of knocking down the pillars of her power bit by bit. Elections for party leadership are set for December, but Merkel is hardly safe until then. On October 14, her Christian Social Union (csu) sister party in Bavaria will experience its worst election result in history. Minister of State Markus Söder is already blaming the government in Berlin for the devastating loss of support. Two weeks later, Merkel’s cdu faces what will likely be another blow during elections in the state of Hessen. The loss of support for the cdu and csu is causing more and more members of the party to demand change. If Merkel loses control over her party, she will inevitably lose control over the chancellorship. She views the leadership of the party and the chancellorship as inseparable. At this point, there is no doubt that Merkel’s leadership will end sooner rather than later. A survey conducted at the end of September 2017 concluded that a plurality of 46 percent wants to see Merkel’s 13-year-old chancellorship end prematurely. Though many are weary of her administration, the fact that it has been in place so long makes any transition difficult. Any new leadership in the present coalition would likely leave Germany even more unstable. There are very few whose strength even remotely compares to that of even a weakened Angela Merkel. Yet it won’t be long before even some of her closest allies will seek to step out of her shadow rather than fall with her as Kauder did. 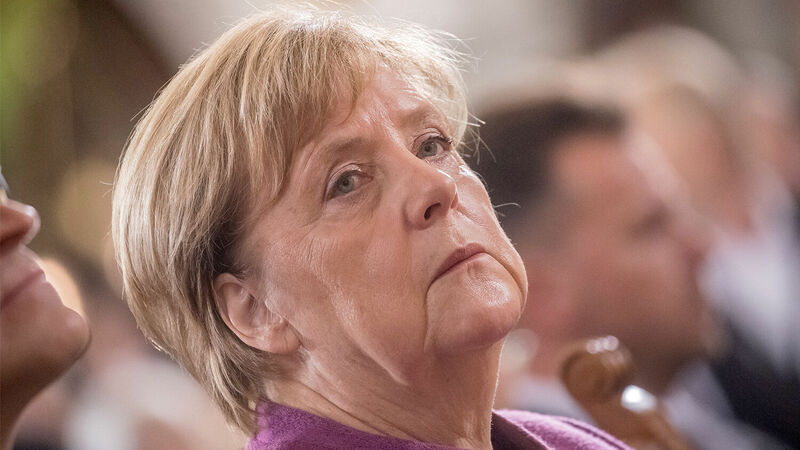 We at theTrumpet.com have often warned that the rising political instability in Germany would help bring about the fulfillment of a major biblical prophecy. When the Bible talks about a king, in most cases it’s saying that this is not a democratic government. Even if he doesn’t have that title, he is going to lead like a king. This vision in Daniel shows that the European empire is about to become a lot more authoritative. Daniel 11:21 prophesies that this strong leader will come into power “by flatteries”—probably not by votes, but through a coalition government of some kind. We need to watch Germany and Europe carefully. Although Bible prophecy gives us the outline of how it will unfold, we don’t know the details. The stage is being set for this man to rise before our eyes. A man is rising who promises solutions to the unprecedented problems of today’s world. Prophecy reveals that though he will bring temporary prosperity, his rise will endanger the whole world.